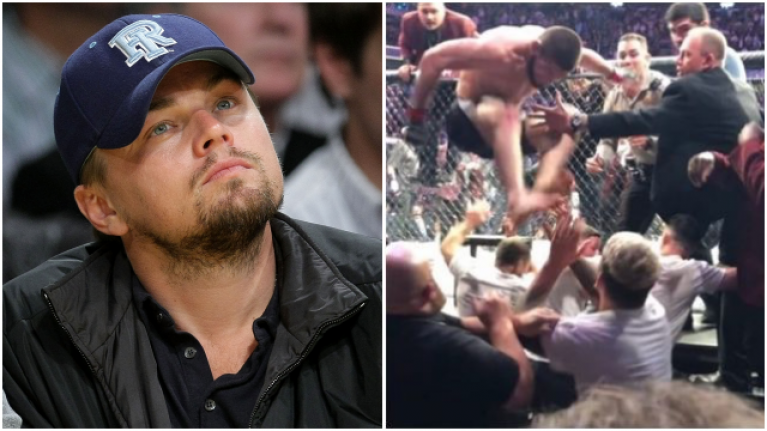 The UFC 229 post-fight melee made plenty of headlines but it could well have resulted in one of the biggest stories of the year as Leonardo DiCaprio narrowly escaped injury following Khabib Nurmagomedov's infamous leap. Nurmagomedov targeted Conor McGregor's teammate, Dillon Danis, when he jumped out of the Octagon last October and hurled himself two-footed in Danis' direction, sparking a brawl between the teams. The UFC lightweight champion has since been fined $500,000 and suspended for nine months by the Nevada State Athletic Commission for inciting the clash but he could have been hit with a significant lawsuit if his aim had been slightly off. Apparently, Nurmagomedov was told after the event that he came close to landing on Leo DiCaprio, who was sat near McGregor's team. "Honestly, I didn’t recognise [the other celebrities in the crowd], apart from Leonardo DiCaprio," Khabib said in an interview with Match TV (via RT). "He’s a big fan [of MMA]. "He told me, ‘I was sitting 5 meters away [when you jumped the cage at UFC 229], you nearly landed on me!'" After the furore, Nurmagomedov had a conversation with DiCaprio and was surprised by how down to earth The Revenant star was when they met as DiCaprio even invited the undefeated Russian to dinner in Paris. Speaking about the Oscar winner, Nurmagomedov said: "He’s a regular guy, but it was surprising to me, when people came up to him for a photo, he said ‘I don’t take photos.’ I asked why, and he said it’s not possible to make everyone happy. "He said he only takes photos with kids… with everyone else it’s not possible. That surprised me, but in general he’s a regular guy."